Derek Lynch creates urban-based idealize landscapes in dreamlike circumstances. His work merges the use of digital photography, painting, and architectural forms that focus primarily on San Francisco neighborhoods. The scenes depicted are familiar but slightly skewed by ambiguous relationships and unsettling juxtapositions of geographic locations. The outcome can be whimsical yet offers a serious sociopolitical commentary on the changes to our urban landscape. Derek was born in Englewood, NJ and currently lives and works in San Francisco. He graduated from the School of Visual Arts in New York City in the early 80�s. He was mentored by artists Frank Owen, John Seery, Francesco Clemente, and Sandro Chia. 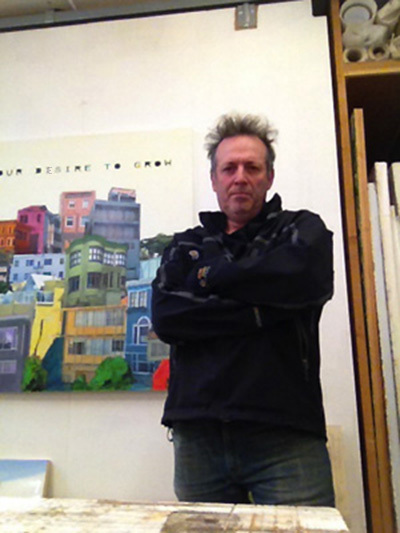 His work has been featured throughout the Bay Area in prestigious solo and group exhibitions. He is the recipient of numerous grants and awards. His band played at CBGB's in the late 80�s at the Christmas specials as the 'Special Guests' and performed live on WFMU radio. Lynch's film debut was at the Castro Theater in San Francisco, BAMPFA in Berkeley, CA, and The Kitchen in New York City in 2000. He is the recipient of numerous grants and awards.